If you want to give a different, fresh and original touch to your kitchen, a good idea is to decorate with wall stickers for kitchens. These are a very easy, fast and inexpensive way to renovate your kitchen in just a few minutes. Undoubtedly, today, the kitchen is one of the most important rooms in home: not only cooked there, but many eat or even watch television, read or study in the table of this home space, hence it is important to be welcoming, a place where you feel comfortable. In decor, the vinyl decorative has been gaining prominence: can be applied anywhere in the house, kitchens being one of the funniest. For the kitchen, in particular, you can find a great variety of designs: from drawings and fruit shapes, phrases, to personal photographs. The good news is that in the kitchen not only have to refer you to the walls: the doors of furniture, refrigerator, an appliance, and any support you want may be renewed with one or some vinyl wall decorations. Just keep in mind that vinyl wall stickers are firmly on any surface, which is smooth and non-porous. You can apply them on painted walls, on metal or glass, on plastic or on the doors of the cabinets. In addition, another advantage of vinyl is that if you get tired of seeing them, you can renew them, or remove them without problem. These do not damage the surfaces on which these have been glued. It is a simple task, and it will not require much time. Once you have bought the vinyl you like, just you need a spatula and a clean cloth. The first thing to do is to make sure the location for paste; it is a surface that is smooth, clean and dry. If it is a wall, first wipe with a clean, dry cloth to remove dust and any dirt that may be present. If it is a piece of furniture or appliance, clean it first with water and make sure it has dried completely. To place the vinyl, first stretching it and present it on the chosen surface. The vinyl comes with a role carrier, thanks to which you can stick it without inconvenience. Start by rubbing the paper with the spatula so that it is well adhered. Then place the vinyl on the surface to be paste, peeling off some part of the adhesive sheet on its reverse side, which is adhered to the surface. It sees withdrawing this sheet while sticking vinyl with help of the spatula (removed with it any air bubbles that may appear, wiping from the center toward the sides). Once you’ve finished paste the vinyl, it is time to remove the role carrier, pulling it gently. You already have placed vinyl. 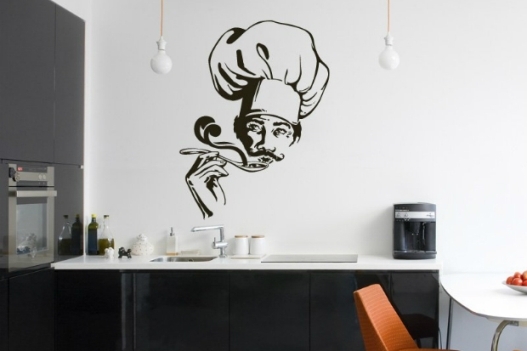 Just go ahead and paste how many you seem to give a new face to your kitchen.